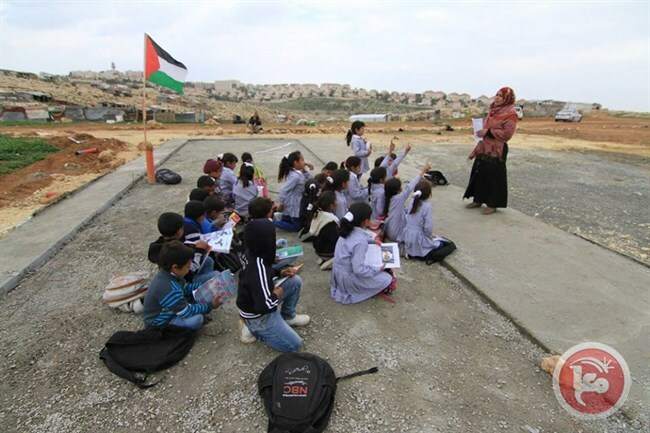 JERUSALEM (Ma’an) — Israeli forces on Sunday demolished a Bedouin school for children in the Abu al-Nuwaar community near the town of al Eizariya in the occupied West Bank, a spokesperson for the Al-Jahalin Bedouin community said. Atallah al-Jahalin told Ma’an that Israeli forces, accompanied by 30 vehicles and a delegation from Israeli’s Civil Administration, raided the area and destroyed the sole school in the community. After the demolition, primary students held a “sit-in” where the school once stood while wearing their uniforms and holding school books in protest. On Wednesday, the Coordinator for Humanitarian and UN Development Activities for the occupied Palestinian territory Robert Piper said the number of Palestinians displaced in 2016 is already equivalent to over half of the total number displaced in all of 2015.